Congrats! Your small business is growing, and you’re starting to consider if it’s the right time to add on to your talent pool with your first, real hire. Up until now, you may have been relying on your own hard work, independent contractors, or even family members to get all the necessary tasks in your company accomplished. So, how do you know when you’re ready to take the plunge and raise your status to legal employer? These guidelines may help. Many tasks related to your business could be done by working with another independent contractor instead of an employee. 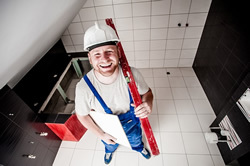 While the determination should be made by following the laws stated for your state or local area, it’s generally OK to hire a contractor for tasks not specific to your business. Having someone come in and clean your t-shirt printing facility, for example, could be a freelance opportunity. Requiring someone to run your shop, print t-shirts, and deal with customers, however, is more likely an employee situation. Before you look at hiring an employee, be certain that it is indeed an employee you need to hire. Just because you feel like you need an employee, it doesn’t mean you can afford one. Use basic accounting tools to determine the full cost of a worker, including benefits, taxes and insurance. After that, decide if your chosen wage amount will be competitive enough to hire the type of quality worker who can thrive in a small business environment. Don’t forget how you’ll track and pay for things like sick leave and vacation, as well as whether you’ll offer rollover accumulations of these benefits. If you’re good to hire, ring up your state’s Department of Labor office to see what the first steps will be. While most of the states have a comprehensive website with the various forms and FAQ’s about what you need to comply with, a call may get you to the starting point faster. If you live in a major metro area, there will likely be city-specific laws in place as well (such as minimum wage or reporting requirements). Get all your legal ducks in a row before you make that first offer of employment. Be sure you are accessing resources as a business, not an employee. This will provide you with much of the following info needed to make appropriate hiring decisions, including state-based hiring and training resources, labor market data, unemployment insurance forms, worker rights, OSHA standards and veteran-specific information. When you’re handling your business on your own, there’s no need to display Federal Minimum Wage posters or have OSHA-compliant MSDS data sheets on hand. When you’re taking on employees, however, everything changes. Your state employment resources should have a checklist of things you need to display or have available to workers in your place of employment, but it may also help to team up with an existing business in your local area and in the same industry to see what they do. While it’s no substitute for getting the requirements straight from government reps, it can be incredibly useful to know that they hang their hand-washing sign in a cute custom frame near the soap dispenser, or that their chemical data sheets work best in a particular type of binder. You shouldn’t have to completely disrupt the workplace to accommodate an employee, but those few small changes you do need to make can be easier when you see how they are already being done. Don’t forget things like break areas, first aid kits, and other compliance amenities that are nice to have and may also be required by law. The IRS can feel like the big, scary thing hanging over your shoulder, and it’s not surprising that many companies cite complicated tax laws as the main reason for not making the leap to employing others. With so many businesses doing it, however, it’s not reason enough to avoid company growth. The important thing is that you withhold and report – the two basic tenets of tax law. Keep records of everything and know if your state requires reporting to be done quarterly, annually, or a combination of both. At a minimum, you’ll need to withhold your worker’s part of Social Security / Disability taxes, as well as pay your share (at the same rate), to be turned in to the IRS on a regular basis. Check with your state to see what type of unemployment insurance you must offer. Because there may be a few bumps in the beginning – especially as you’re learning – it can make businesses wonder if it’s worth it to wait before hiring again. Fortunately, once you have the system in place to hire one worker, it’s pretty seamless to add team members down the road. If you’ve decided now’s the time to hire, just do it already!